Birthdays are a great time to celebrate people’s accomplishments. Age brings wisdom, achievement and satisfaction. 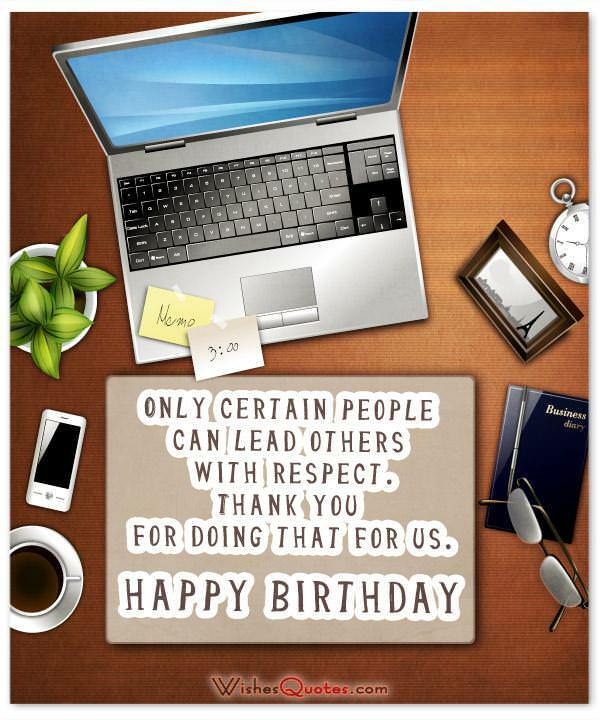 Your boss’s birthday is a good time to pay your respects and show gratitude for all the help you’ve gotten. Honoring your bosses on their birthdays can be an iffy proposition because you have to be mindful that you don’t cross the line defined by professionalism. There may be some instances when it’s okay to act with familiarity: Your office culture encourages informal communications or you belong to a small team where everyone is on first name basis. 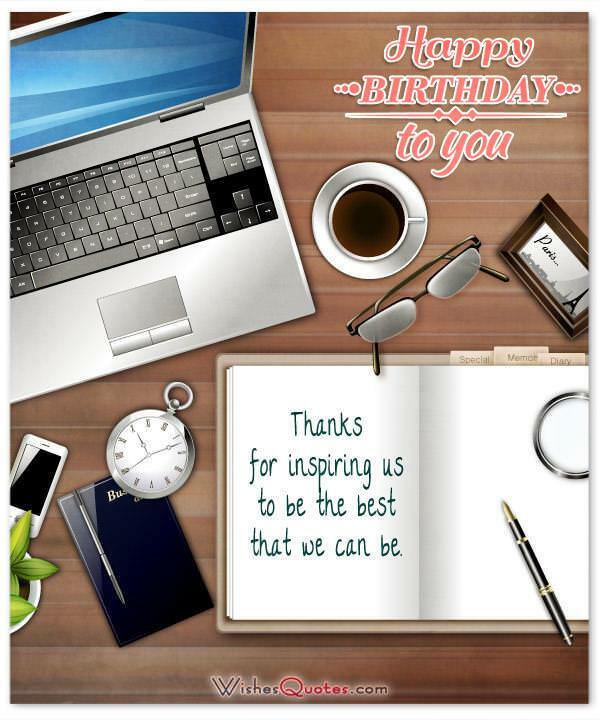 Regardless of the situation, sending birthday wishes to supervisors or executives higher up the corporate ladder provides perfect opportunities to express gratefulness for their work and their support. Let the following messages inspire you to put together birthday messages and wishes that are most appropriate for your boss. Show your boss some special appreciation at the office with a cake and a card from everyone. Add one of these special greetings to let him know you really think highly of him. 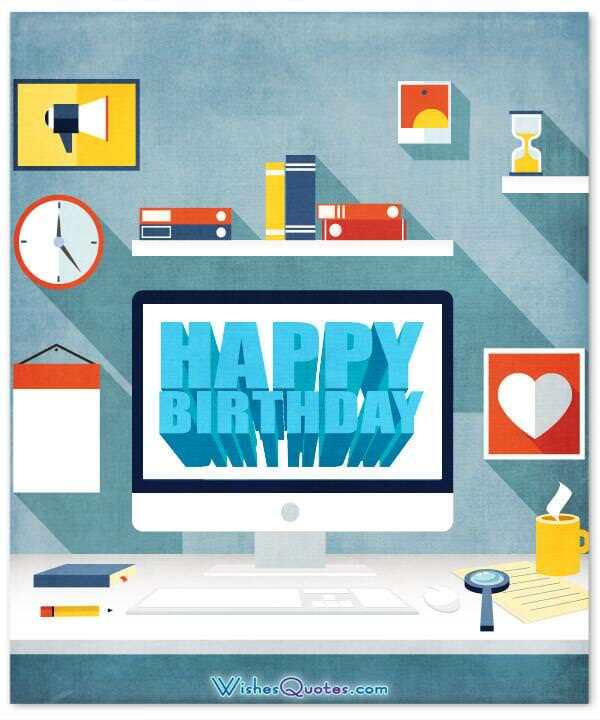 Send a text message to your supervisor at an appropriate time, wishing him or her a happy birthday. Use one of our greetings for a brief but meaningful recognition of his importance. If you work from home, don’t forget to include a birthday greeting in one of your emails to your supervisor at the office. Let her know how kind and helpful she’s been and how great it is to work for her. Choose from our special sentiments to send a message that really impresses her. Stop by the boss’s office with a small gift as a token of your appreciation. Add a card with one of our sentiments that says what you really feel. The world would be a much better place if we had more leaders like you. You always put the team before yourself. You take the time to mentor those who can’t keep up, yet you play fair with everyone. Happy Birthday, boss! What’s a ship without a captain? We’re lost without you. Happy birthday! To your team, you are a mentor, a leader and a coach. By your examples, you’ve shown us how discipline, teamwork and common sense can get things done. You are an inspiration. Cheers on your birthday. I remember when you said you’d take me on. Thanks for having confidence in me. Thanks for inspiring us to be the best that we can be. Today is National Boss Appreciation Day. Ssshhh… we made that up to honor your birthday. 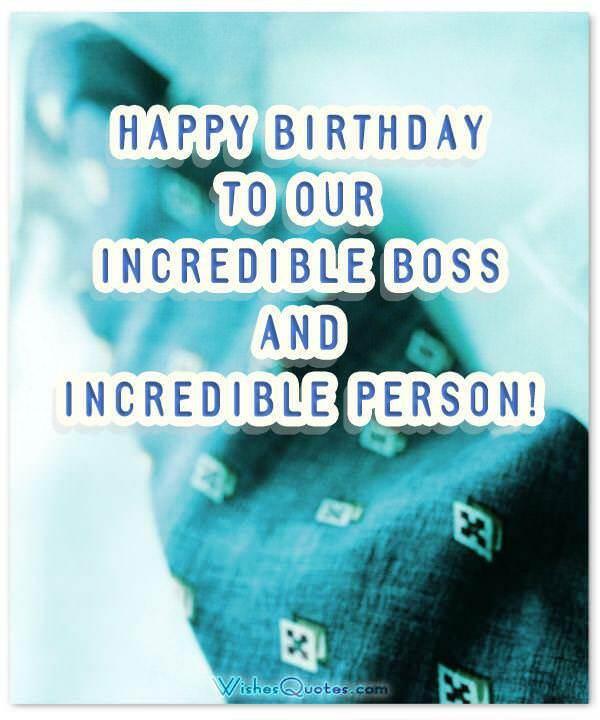 We hope you know how much we appreciate your boss-ness. It’s celebration time for a hardworking person who also happens to be a wonderful human. Have a lovely birthday! Here’s to a brilliant birthday for a brilliant person who never ceases to inspire the team. You are always in the line of fire, but you take the heat for us like a good leader should. We appreciate your efforts to keep this team rolling and achieving. Birthday cheers! Here’s to a stress-free day on your birthday because even the best bosses deserve time off to smell the flowers. Life coach, mentor, team leader: you’re the greatest. You’ve always cheered us on. Today we celebrate you. A good boss is one who steers you away from making catastrophic mistakes. But when we do, you’re the first one reaching out to help us up, for which we are eternally grateful. Enjoy a well-deserved break on your birthday. Thanks for inspiring our team to great heights. Happiest of birthdays! Even bosses are allowed to enjoy a little cake and ice cream on their birthday. We hope you have a wonderful day today. Always calm in the face of deadlines, able to keep us all on track — that’s you! Life’s a puzzle, and so are these files. Glad to know we have your expert problem solving to get us through. Hey, boss, you can’t manage without us! Just kidding. We could never manage without you! May your day be filled with peace and fulfillment away from the chaos of the office. We hope you enjoy your birthday with people who are near and dear to you. It’s really nice to work with someone who knows what it takes to be successful in this business. We are glad to be here. Happy Birthday! Don’t worry about taking time off for your birthday, coach. We’ve got it covered. It’s a great experience being part of your team. I look forward to another year. Thanks for traveling this road with us and leading us onward. Best wishes to the kindest, most generous leader any company could have. You see the office with such clear and confident eyes and handle everyone with such kindness. Wishing you another year of the strength and inspiration that you share with us every day. Three rousing cheers for the best manager any office could have. Happy birthday! We wouldn’t be a team without you. Have a great day today. Nothing tops the experience of working as part of your team. This has been such an exciting year. It has meant a lot to me to work with someone as kind, steady and competent as you. As a boss, you rule. Here’s to another great year of working with you. Have a great time on your birthday, and know that we think of you highly. Thanks for sharing the secrets of good management and leading us through another great year. Bosses come and bosses go. A great boss influences us forever. Thanks for being that leader. I appreciate all you’ve done to make my work really enjoyable and meaningful. Thanks for being a great manager, especially really when the going gets rough. I’m proud of my place in an office that runs smoothly and produces such high quality work, thanks to you. Bring on the deadlines! With you as our fearless leader, we can tackle anything! Take some time for yourself today, boss. You deserve it. You’re an inspiration, a creative whiz and a master at solving problems. And you get better at it every year. The best thing about being in this office is working for you. I’m sure all of us feel the same way. May you have another year of good times and great accomplishments. Here’s to the boss!